NOTE: All books are Out of Print unless othewise specified. Twelve signed photographic tinted etchings with a signed frontispiece. Loose in portfolio with a molded taupe colored portfolio encased in a matching two-fold case. This portfolio brings together many of Fini's drawings and graphics in new, innovated juxtapositions. Ten pages of text and numerous photos of Fini's 19 cats in her studio with her paintings as backgrounds. Fini's love for cats is legendary and this book is a paean to that love. From sedate and sleek to rambunctious and silly, the cats prowl the atelier with curiosity, mischievousness and unfailing charm. Also available in an unchanged 2nd Edition. 40 color reproductions of paintings from 1970 through 1988. Pictorial white paper wraps, many powerful new paintings not previously published. The loss Fini suffered with the tragic death of Constantin Jelenski in 1987 is evident in the depths of pain and emotion seen in much of this work. Includes letters from Leonor Fini, Leo Castelli, Oscar Demejo and a poem by Charles Henry Ford. Texts in English. 82 color and 54 black and white illustrations; pictorial paper wraps with "Demoiselles de la nuit." This catalog highlights Fini's commercial work including designs for opera, theater, ballet and books. It contains the only accurate and comprehensive bibliography of Fini to this date. Also included a Deluxe Edition of 350 numbered copies, signed by the author and bound in gold embossed black silk boards. Introductions by Jean-Claude Dedieu, Severo Sarduy and Jean (Bautista) Pinero. 26 color pages and 3 black and white pages. Included is one of the last photographs taken of Leonor Fini. Maroon paper wraps with color illustration. Includes five illustrations of near paintings appearing for the first time. Light blue paper wraps. Includes illustations of new works which are appearing for the first time. 94 reproductions of paintings in full color and one black and white photograph of Fini from the 1960s. Bound in black cloth boards with a pictorial dust jacket featuring "Femme de la lune." A new chronological look at Fini's paintings. A well presented selection with a few works that appear nowhere else. 82 black and white illustrations. Pictorial paper wraps. A scholarly dissertation n the full body of Leonor Fini's work. 22 black and white and 4 color illustrations. Pictorial wraps. An Italian language edition of Leonor Fini ou les Metamorphoses. Texts by Leonor Fini, Jean-Claude Dedieu, Constantine Jelenski, Victor Brauner, Paul Eluard, Jean Genet, Alberto Moravia, Jean Cocteau, Marcel Brion, Max Ernst and Janus. 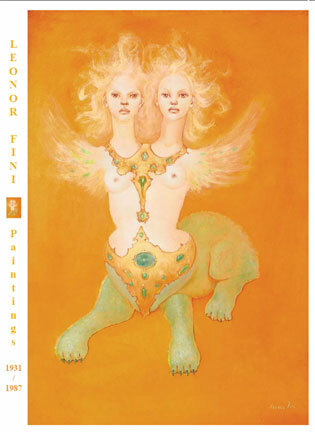 Includes 92 pages of Leonor Fini's artwork from 1924-1995- many published for the first time. 19 pages of biographical information and an updated bibliography. Pictorial dust jacket. 27 pages of personal memories and a discussion of Fini's work. Over 75 rare photos of Fini, her friends and environment. More than 85 illustrations of her paintings, drawings and watercolors, many seen for the first time. This is the catalog for the largest retrospective and sale of Fini's work to take place outside of Europe. Also available in a Deluxe Edition of 40 copies signed by the author and accompanied by an original lithograph "La Grande Parade des Chats," pencil signed by Fini. Author's Edition of 100 Hardcover copies signed by the author. 72 color plates and 20 black and white illustrations; bound in papers with pictorial dust jacket featuring "Vesper Express." This is the catalog for the first museum retrospective after Leonor Fini's death in 1996. The exhibition has works from as early as 1924 and has late as 1995. A wonderful edition to any collection. Pictorial paper wraps. An exhibition of Fini's portraits spanning the period from 1925 to 1995. Features over 30 illustrations of Leonor Fini's costume and set designs for ballet. First biography & monograph of Leonor Fini. Includes over 300 Illustrations, photos and Artwork. Official catalogue of the largest museum retrospective of Fini's work, perhaps the finest and most extensive collection of Leonor Fini art ever published. Over 300 pages long, this volume features hundreds of images of Fini's art, life amd career; some never before seen in print. An excellent companion peice to this extraordinary exhibition. Catalogue to accompany an extraordinary exhibition of Fini oil paintings. Each color illustration is accompanied by background information on the painting. Features many color photographs. Paperback. 9" x 12", 32 pages. Also includes a Deluxe Edition of Hard Bound Copies, signed by the author and bound in gold embossed black silk boards.